Farinata is a simple dish originating in Genoa, Italy. It’s traditionally vegan and gluten free, so it makes the perfect alternative to an omelette, thick pancake or flatbread. In Southern France it is called Socca. Pour the warm water into a large bowl and sieve in the chickpea flour, salt and paprika a little at a time, whisking all the time to avoid lumps forming. You will end up with a thin batter. Cover the bowl with cling film and leave in a warm place for at least two hours, or you can leave it overnight. 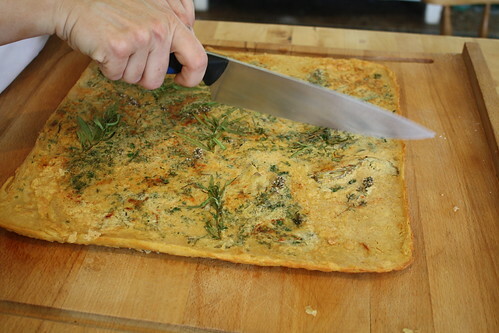 Remove any foam that has formed on top of the batter and stir in the olive oil and most of the parsley. Heat a shallow baking tin (approximately 26×36cm) with 1 tbsp of olive oil. When the oil is hot, pour on the batter and sprinkle with the artichoke hearts, sun blushed tomatoes, capers, olives and thyme. Sprinkle with the paprika and Maldon sea salt. Return to the oven and bake until set and browning on top, which will take around 15 minutes. Serve at once, cut into wedges and sprinkle with the remaining parsley. Chickpea flour, Gram or Besan flour is gluten free and less starchy than wheat flour. Excellent for batters.